There are a surprising number of restaurants around Tha Kaek, but it's worth noting that many of them are not set up to cater to westerners, so you may not find an English menu or much English spoken by the staff. That said, you certainly won't go hungry, and you're still spoiled a bit for choice. The place to start, naturally, is the riverfront road, which is lined with little carts and stalls on the river side of the street, and a number of small restaurants in the shop-houses on the other side. The stall fare varies from chicken to fish to barbecued bananas and anything else that can easily be snacked on. Many of the restaurants specialize in grilled duck, which seems to be a local specialty. Fish is somewhat less dominant here than it is on the other side of the river in Thailand. The more tourist-friendly places can be found along the plaza which extends away from the river in the center of the old town area. The restaurants offer mostly Thai food on their English menus, but also have burgers, fish and chips and other common western dishes. Most of the restaurants are simple open-fronted shops with no air conditioning. The top end of the dining scene at the time of this writing appears to be the Inthira Hotel, right at the intersection where the plaza meets the main road. The Inthira is popular with travelers from outside the hotel, and serves breakfast, lunch and dinner. Somewhat surprisingly, there are no coffee shops around town. 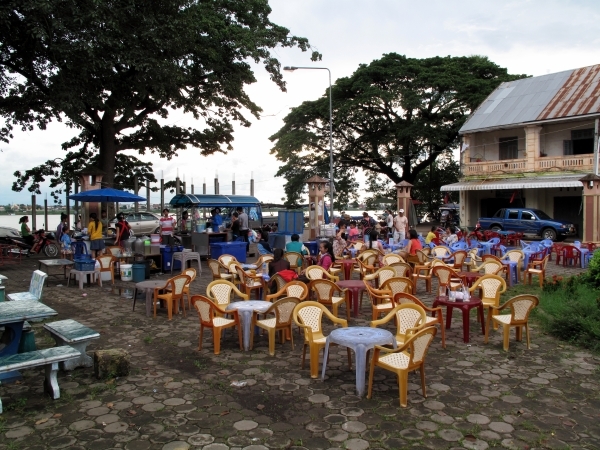 There's a small Lao Coffee stall down of the riverfront in between some grilled duck places, but other than that the best place for a decent espresso or cappuccino would again be the Inthira Hotel.